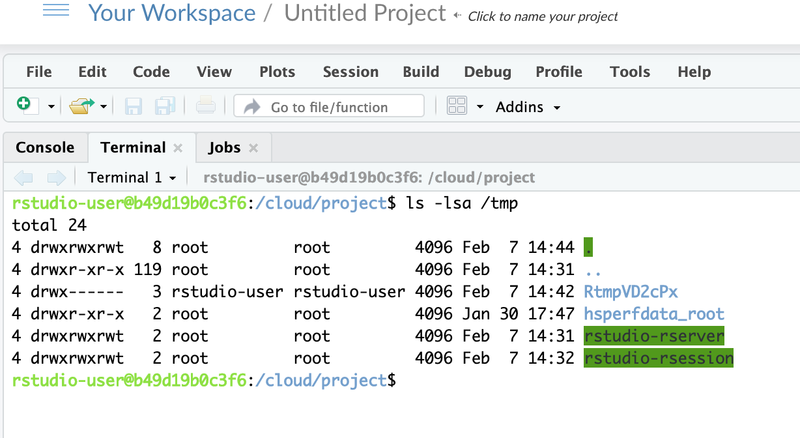 Packages needing compilation, such as brms, need writing rights for the /tmp directory or they will issue an error (see https://community.rstudio.com/t/will-rstudio-cloud-permit-packages-that-need-compilation/20883). On my local machine, I solve the problem by running sudo mount -o remount, exec /tmp in the terminal. However, to do that you need super user rights, which is not the case in RStudio Cloud. Any other solution? /tmp is writeable, there should be no need to remount it. Could you share a specific case where you are experiencing an issue? This is the output of a small script I use for teaching when running on RSrudio Cloud. The same problem is solved on my Xubuntu 18.04 by allowing to write and execute files in the /tmp directory (sorry I forgot to mention that before, although it was clear from the shell command) . Thank you! to the package is available through vignette('brms_overview'). Run theme_set(theme_default()) to use the default bayesplot theme. What indicates that the issue is the ability to write/execute files in /tmp? Far more likely is that the compilation is hitting the memory limit of 1 GB. I am going to test that theory myself. Have you tried using one of the base projects that the Stan folks have created? Those are configured to use clang instead of gcc, which they say makes better use of the available memory. I think the issue is executing the compiled C++ model because the same occurs on my local machine if I don't remount /tmp as exec. Besides, the data include few observations and I have 32G RAM, which apparently does not help. But the error message is during compilation, not execution. Given you have 32 GB locally and there is only 1 GB on rstudio.cloud, I still suspect that is the issue. Would you be willing to DM me the CSV file you have in your example? I don't actually know how to use Stan, I just pretend really well by copying what others do. I can confirm that it is running out of memory during compilation, and that using the base project the Stan folks put together that uses clang does not help. It is just part of the root filesystem.